Built in 1968, this building is Elgin’s 5th City Hall since its incorporation in 1854. The building was designed by notable Chicago architecture firm in the International Style, Skidmore, Owings and Merrill. They are known for their design of Chicago’s Willis Tower, formerly known as the Sears Tower, built in 1973, as well as the John Hancock Center (1970), among many others. 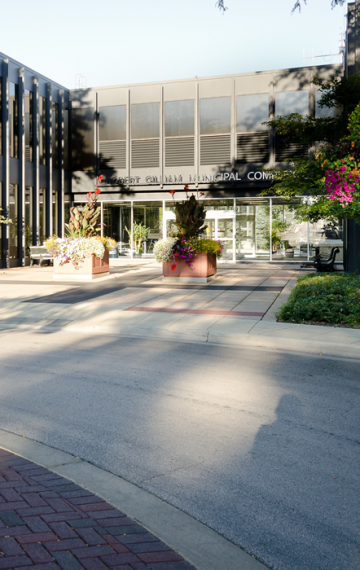 Elgin’s City Hall was designed to reflect beauty and function creating a new era of design in governmental architecture. The design is based on principals set by notable German architect, Ludwig Mies van der Rohe who famously authored, “Less is More.” SOM borrowed the Miesian vocabulary of simplified, and efficient use of glass and steel constructed on a rigid grid system. This rigid grid system can be seen on this building in the decorative use of I-beams that are evenly spaced around the entire façade. Uniquely, the building once had an exterior breezeway on its first floor that separated the north and the south towers. This was enclosed around 1996 to accommodate more services and nicely join both towers together. The building’s original uses included a Communications Center, No. 1 Fire Station, the Finance Department, City Council Chambers, the Police Department, Community Development Department, and even a Pistol Range! Many of these uses are no longer within City Hall as it has been adapted to meet new needs of the City. International Style The International style came from western Europe in the 1920s from the earlier work of noted architects Le Corbusier in France, and Walter Gropius and Mies van der Rohe in Germany. Aiming to create a new modern form and functional thinking of architecture, these architects abandoned tradition to create a pared down, unornamented style that emphasized geometric shapes, viewing it as architecture for the modern age. Buildings of the International style were starkly different than those of previous eras in not just appearance. Utilizing new construction techniques and materials buildings incorporated Flat roofed, asymmetrical and with bands of windows set into a rectangular form.